Have you met Nicole Flint? If not, allow me to introduce you. Nicole is the adorable girl in the above photo, and the chairs are her creations! Let's take a closer look at her work. How fun and unique is this? Love the touch of turquoise! Who wouldn't be happy sitting in this chair? Love the dainty, feminine look of this one! 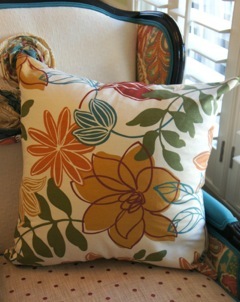 Nicole also creates gorgeous pillows and sofas. You can see more of Nicole's collection HERE. to one lucky Sweet Chaos reader. 2. Click HERE and "Like" Nicole Flint Collection on Facebook and leave me a comment here letting me know you did. That's it! Easy peasy!! Enter by Wednesday, February 15th at Midnight EST. I'll announce the winner next Thursday. I went a liked her ob fb! I LOOOVE her chairs! They are so fun. very cool giveaway. 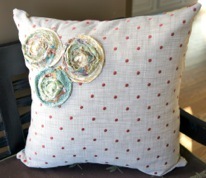 What an adorable pillow! I like the front the best with the dots and the homemade flowers. Please enter me in this great giveaway. I am a follower of your blog and I "liked" Nicole's facebook page. I liked Nicole Flint on FB!! Such creativity! Nicole's chair designs are so much fun! How fun are these? What a great idea to transform these comfy chairs into functional art pieces! Love them! So fun for a bedroom or family room - following you, "liked" Nicole on FB and happy to do it. I follow you. I liked Nicole on FB. The chairs are works of art. Seriously! I am a faithful follower of Sweet Chaos. I am stopping by from Debbie's. My first visit. Your home is absolutely gorgeous. I've clicked to follow, so I can keep up with Sweet Chaos! Beautiful blog! I clicked Like Nicole Flint at FB. I gladly liked her page on FB. What a great idea to bring new life to old furniture. I'd also like to thank you for my new love of the color Sea Salt. Hi! I am now a Follower. Love your blog - great ideas for remodelling and decorating. I also Liked Nicole's Facebook page. Hope I win! Hey Carolyn! Love the chairs and hit the like button over at facebook. Thanks for sharing! I'm a follower of Sweet Chaos! Love your blog! Nicole looks amazingly talented!